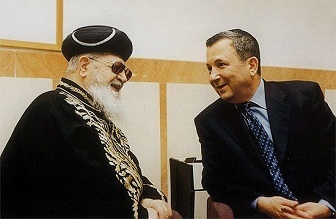 Talmudic ideologue O. Yosef and Zionist War Criminal E. Barak. "Whenever Orthodox rabbis use the word human, they normally [don't] refer to all humans, but only to Jews, since non-Jews are not considered humans according to Halacha of Jewish law." "Non-Jews were born only to serve us. Without that, they have no place in the world -only to serve the People of Israel,"
Yosef said in his weekly Saturday night sermon which was devoted to laws regarding actions non-Jews are permitted to perform on the Sabbath. "In Israel, death has no dominion over them...With gentiles, it will be like any person. They need to die, but God will give them longevity. Why? Imagine that one's donkey would die, they'd lose their money. "This is his servant…That's why he gets a long life, to work well for this Jew." "why are gentiles needed? They will work, they will plow, they will reap; and we will sit like an effendi and eat." "That is why gentiles were created." "The difference between a Jewish soul and souls of non-Jews -- all of them in all different levels -- is greater and deeper than the difference between a human soul and the souls of cattle." Some of Kook's manifestly racist ideas are taught in the Talmudic college, Merkaz H'arav, in Jerusalem. The college is named after Kook. In his book, Jewish History, Jewish Religion: The Weight of Three Thousand Years, the late Israeli writer and intellectual Israel Shahak argued that whenever Orthodox rabbis use the word "human," they normally didn't refer to all humans, but only to Jews, since non-Jews are not considered humans according to Halacha of Jewish law. A few years ago, a member of the Israeli Knesset, castigated Israeli soldiers for "treating human beings as if they were Arabs." The Knesset member, Aryeh Eldad, was commenting on the evacuation by the Israeli army of a settler outpost in the West Bank. However, while the Reform and Conservative sects of Judaism, have related positively to such calls, most Orthodox Jews have totally rejected the calls, arguing that the Bible is God's word which can't be altered under any circumstances. The Bible says that non-Jews living under Jewish rule must serve as "water carriers and wood hewers" for the master race. "That day, Joshua made the Gibeonites woodcutters and water carriers for the community and for the altar of the Lord at the Place the Lord would choose. And that is what they are to this days." Elsewhere in the Bible, Israelites are strongly urged to treat "strangers living in your midst" humanely "because you yourselves were strangers in Egypt." ● Palestine Information Center: 2000-present. Furthermore he is a prolific freelance writer contributing to many websites, e.g., PalestineThinkTank.